TL;DR Linux, Apache, MySQL, PHP, NodeJS, ZeroMQ, Redis, WebSockets. A few years ago this would have been a no-brainer for me: PHP 5.x, MySQL 5.x running on Linux and served through Apache. Job done. Like many other web developers I've been working with fairly typical LAMP stacks for years. They're tried and tested. They have a wealth of tools available. They're robust. They're predictable. They're comfortable. Nowadays life isn't so simple. From the outset the only absolute certainty was that Linux would be the OS of choice. NoSQL databases are many and varied. Numerous programming languages exist which demand the attention of even the most avid PHP developer. Even Apache doesn't have it easy, with rising stars like nginx adding yet more complexity to an already dizzying array of decisions to be made. In the end familiarity and predictability won the day; faavorite would indeed be built on a traditional LAMP stack. That was the plan, anyway. I was perfectly happy to consider other technologies where they made the most sense, but as far as possible the site would be built on the same technologies which have been powering some of the biggest websites in the world for years; the same technologies I know how to work with in the real world and the same technologies I know I can rapidly prototype, test and deploy with. Learning new stuff is fantastic, but there's a lot to be said for staying within your comfort zone when you've got a mountain to climb and not a lot of time to do it in. 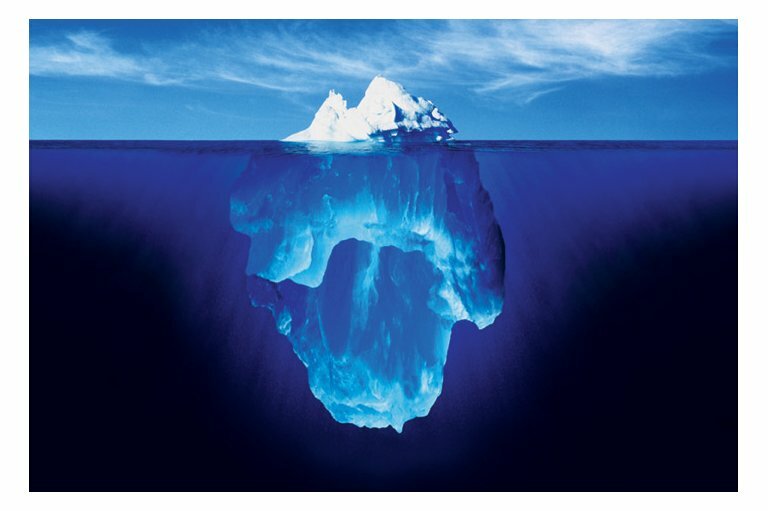 The analogy goes like this: the tip of the iceberg—the only bit visible above the water—is what the user gets when they request a page. It's fairly simple, limited in scope and easily manageable. That's our request-response cycle. All the background tasks make up the looming, unwieldy mass hidden from view beneath the water's surface. This summed up fairly accurately how I felt about about the project—most of the hard work lay out-of-sight, down in the murky depths of the various background tasks. Plus, it let me invent my own terminology about "sub surface" issues and make jokes about "choppy waters ahead" and stuff. Which, if anyone had been present to hear them, would have been hilarious. So then: how are these various parts of the Iceberg going to talk to each other? (The Iceberg analogy is a little fragile here since I don't think Icebergs communicate much at all, but bear with me). I already knew the answer to this one: ZeroMQ. I won't go into huge detail about why I chose ØMQ here—I just needed a simple messaging system to connect the various parts of the app. There are plenty of other message queuing systems out there and plenty of other ways I could have got my Iceberg talking, but I've used ØMQ for various experiments over the past year and always enjoyed it. It's performant, quick to set up, has bindings available in tons of languages and simple to use. The first natural area of icerberg-intercommunication to look at was importing a user's favorites from Twitter upon initial signup. It seemed easy enough—greet a new user, bung a message on a queue and process that message with a long running PHP daemon. 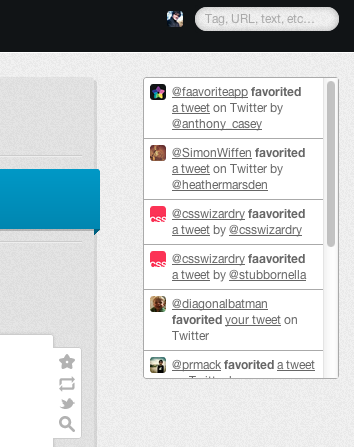 The daemon itself would simply fetch the first few hundred of the user's favorites via Twitter's REST API. And so it was… for a while at least. However, with a maximum of 200 favorites returned per API request and a target of 600 per initial import (coincidentally the amount of favorites I had at the time) this meant 3 potential HTTP requests to begin to import a user's favorites. 3 requests in PHP meant 3 sequential, synchronous requests, which on a bad day could take anywhere up to 6 seconds (the Twitter API is seriously overworked). Let's think about that for a moment. One user. Six seconds. Just to fetch a few hundred initial favorites from Twitter (not including any actual processing we needed to do in the app). All the while blocking the daemon from receiving any more messages. This was not going to scale well at all. At this stage it was time for the current darling of the web development world to make its first appearance. This isn't the place for arguing the pros and cons of node.js but for me this was an obvious use-case: lots of I/O (the http requests) and not a huge amount of CPU required, plus the huge benefit of being able to make each HTTP request asynchronously and allow the daemon to continue to receive more messages whilst others were currently being processed. Node's asynchronicity makes stuff like this an absolute breeze—you get a natural performance boost by performing multiple requests simultaneously, whilst the evented architecture means you aren't just chewing up CPU while you wait for various responses. If you cast your eye back to the rough application breakdown you'll see that in fact all of the sub surface tasks are incredibly well suited to node.js. Consequently, that's exactly what I wrote them in. I'm not personally convinced about node's merit as a web server, so I didn't use it as one. I was never convinced about PHP's merit as a URL resolution tool, so I didn't use it as one. The takeaway: use what works when it makes sense. I finally started using CoffeeScript at some point when building faavorite. I loved it so much I got thoroughly carried away and rewrote all the underwater tasks in it. I even stopped compiling the CoffeeScript into JS before running it (the coffee executable lets you do that on-the-fly) to avoid having the source and compiled versions of each script in the git repository. For some of the offline tasks this was a mistake. Every time they started up (usually via a cron job), the coffee executable would spend a short amount of time (usually < 1s) compiling them. In human terms that's not a lot, but it's a lifetime of CPU cycles, and completely unnecessary. Eventually I settled for compiling my CoffeeScript for cron tasks and I felt better for it. I still just run *.coffee files for the long running daemons since the startup time is less crucial. I've already touched on some of the rationale for sticking to a LAMP stack where possible: comfort. I've developed enough sites in PHP over the years to get a reasonable feel for not only how it performs, but why it performs in a given way. More importantly, in recent years I've learned how to test it too. I'm reasonably good at estimating how long something will take, how I'll do it, and how I'll test it. These things make me feel comfortable. Consequently, every bit of code which slipped below the surface simultaneously disappeared from the testing radar, out of sight and out of my comfort zone. All of a sudden I had huge (icey) chunks of code performing hugely important tasks covered by some threadbare tests. I knew I had to do something about it, but I lacked the domain specific expertise to do it. What testing framework would I use? Would it properly integrate with my existing test reports in Jenkins? How could I measure code coverage? How do you write testable, asynchronous node.js code, some of which interacts with a third party service (Twitter's REST API)? As I said: comfort. You can be an awesome programmer, but don't underestimate the difficulty applying your skills in a new domain. Eventually I got the testing situation a little more under control using vows.js and used its xunit output mode so Jenkins could aggregate my node.js test results with those from PHPUnit. I'm still refactoring things to make my node.js logic more testable and improve its code coverage, but it's getting there (a good day's focus would go a long way to sorting it out completely). You may be wondering why I caused myself all this unnecessary bother in the first place—I was optimising against as yet unproven performance concerns. The mantra of "premature optimization is the root of all evil" is well worn and was not lost on me. Similarly, I could see the spectres of Agile methodology (something I loosely subscribe to) nagging me that I should be burning (down) towards that MVP, focussing on "working software" and being prepared to "respond to change" when necessary and not before. That said, one has to be pragmatic. Dogma alone is not enough to justify a lack of forethought and planning. I knew PHP wasn't going to cut the mustard for what I wanted to do in the way I wanted to do it, so it was better to bite the bullet sooner rather than later. I'm not sure wheeling out some well trodden soundbites would have got me off the hook when the whole thing came crashing down should people start using the app when we launched. I'm no expert but I had a rough idea where the bottlenecks would be, so diligence compelled me to tackle those areas head on before they overwhelmed the project. So, how does all this stuff work? The vague answer is a combination of long running daemons, regular cron jobs and ØMQ flavoured glue. The detailed answer is, well, very detailed and would make an already long article significantly longer; watch out for subsequent writeups focussing on discreet application chunks instead. I'll go through a high level explanation of the initial import and URL resolution processes but the rest will have to wait. There are two important things to note here. First of all, we naturally have to follow redirects. For starters, the vast majority of URLs we resolve are actually Twitter's t.co links, which guarantee we're in for a redirect. 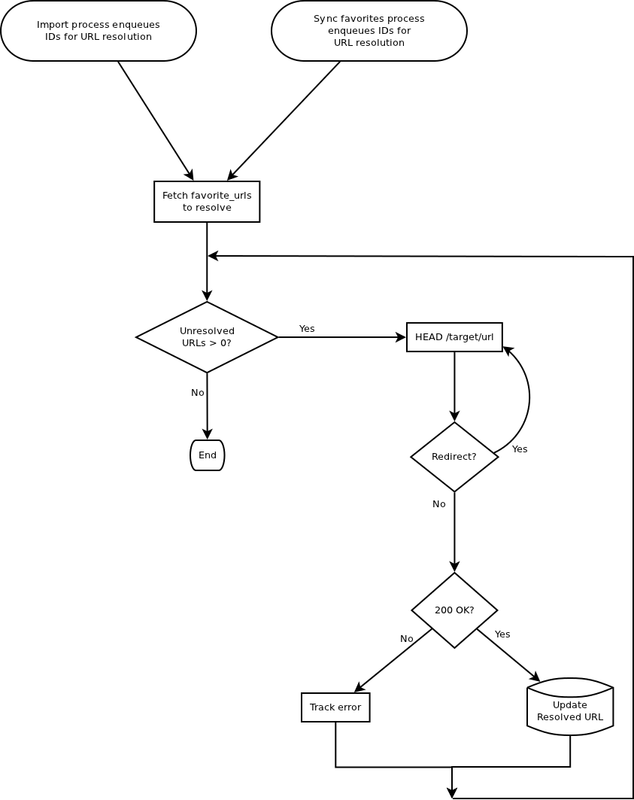 Of course, other URL shorteners (bit.ly et al) are still in widespread use, meaning we could be redirected a good few times before we uncover the actual destination URL (there is a maximum redirect threshold not shown in the diagram, to prevent things getting out of control). Secondly—and crucially—we only ever issue HEAD requests. This process isn't interested in the content of each URL; its sole purpose is to work out what the destination URL is and categorise it according to any 'known' URL patterns whose content we're interesting in embedding when a user views a faavorite. 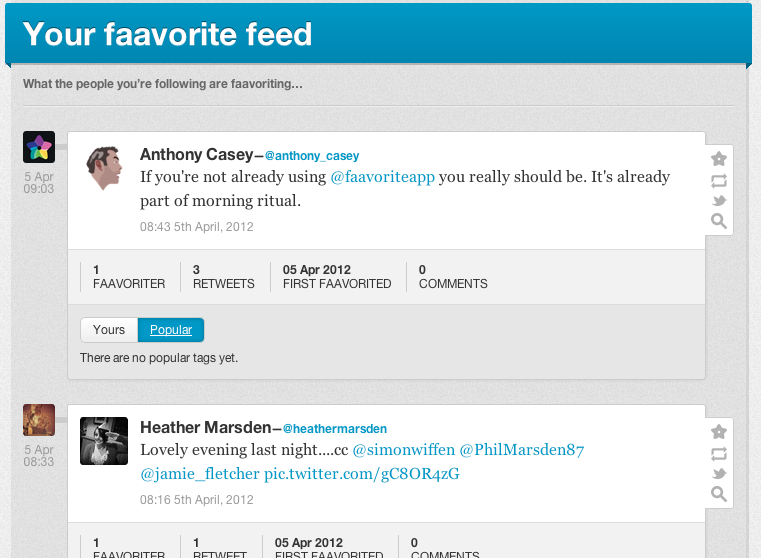 If you imagine for a moment that the process to sync an existing user's favorites from Twitter is similar to the above (it is) then one of the few missing pieces of the puzzle is the question of how we spider any 'known' URLs turned up by the URL resolution process in order to embed content when viewing a faavorite. The answer to this is reasonably simple: a regular cron job which checks for any new 'known' URLs and queries the relevant API. For example, if we have a newly identified URL which looks like a Github repository, we'd take the relevant parts (the username and repository name) out of the URL and feed them into Github's developer API. If we get a successful response, we update a metadata field against the URL with the contents of that response: et voila. Each type of 'known' URL contains additional data including a TTL value, meaning that some are only ever spidered once (e.g. instagram photos, spotify albums) whereas some are spidered semi regularly (Github repositories, Stackoverflow questions). This prevents content becoming out-of-date in some circumstances. I hate the concept of a perpetual beta—so much so that initially I was against the idea of any sort of phased rollout. Either things were going to work, or they weren't. However, as d-day approached I started to lose faith in this rather gung-ho attitude and eventually realised that some sort of beta mode—where I had control over user numbers and access—was essential. I still didn't want to call it a beta though, so we set up try.faavorite.com instead. Much better. if not, redirect to the holding domain with a special GET parameter which triggers some blurb about the site not being ready for everyone yet. I maintained this settings file on the server, outside of our git repository and outside of the release process, to allow quick and easy additions of users on an ad-hoc basis. It worked extremely well and took very little time to write. The trial period proved absolutely invaluable from both Harry's and my own perspective, so I would strongly encourage anyone to consider your own mechanism before launch. No developer likes temporary code graffitied all over their codebase but with a bit of thought a solution might present itself which turns out to be small, self contained and hugely effective—and ultimately well worth doing. Note that in our case the typical 'invite only' model didn't really work—we don't take email addresses so the signup form would have had to take a twitter username instead, and I really didn't fancy writing a form which I'd have to test and validate. The solution I went with felt like the best comprimise. At some point in February when it felt like ages away, Harry and I agreed to launch faavorite on Sunday 18th March. We got the beta out on Wednesday 14th (later than we'd hoped) which meant we were either in for a very long weekend or a missed deadline. In the end, we got there a few hours late: we launched around 2pm Monday 19th. I wasn't happy unleashing a complex system we hadn't performance tested without some sort of escape route so at some point reworked the beta logic a little, such that when we flicked the switch and made the full site live a 'capped registrations' mode kicked in. In many ways this was even simpler than the whitelist logic: I could control the absolute number of permitted rows in the users table via an unversioned settings file which simply contained a key and an integer value. If you tried to register and the number of users had hit this value, you saw a 'sorry' page. If it was less than the value, in you came. So, Monday lunchtime rolled around and we snuck out release 1.0.0. I set up a redirect to force try.faavorite.com to faavorite.com, set the cap to allow 50 new registrations, and Harry, myself and the @faavoriteapp twitter account started spreading the word. We filled the 50 slots in under 10 minutes, imported roughly 10,000 tweets and resolved & spidered about 5,000 URLs. Everything worked. So we went to the pub. Almost more importantly, I could measure the background impact that users and their imported favorites had on various parts of the site (mainly the database). Faavorite is unusual in that each 'new' user brings with them a boat load of data (sometimes thousands of tweets and URLs) so I wanted to analyse the ongoing performance of the site in a controlled manner. I should have seen this one coming. Capped registrations coupled with Harry's strong following on Twitter created an almost siege like impact every time we rolled out another 50 or so registrations. I'd tweet, he'd tweet, @faavoriteapp would tweet, and we'd get a slew of people trying to get a space as quickly as possible. I'd unwittingly created a mini DDoS situation all of my own doing, which meant that each time more registrations were rolled out I sat anxiously watching the server to make sure everything went smoothly. This pattern was particularly painful whatsoever during the early days of launch when I was unsure how the system would scale, so it's something to be mindful of. I've talked a lot about what happens below the surface but not yet really touched on on site performance—what users actually experience when browsing round the site. There are a few areas of interest here. When starting the project I had no idea quite what a complex, widely discussed area of interest feed generation was. How hard can it be, right? The basic idea is to simply take a subset of all tweets (well, favorites in our case) authored by a user who the current user is following. Hmm. Sounding a bit more complex already. The MySQL query itself isn't too bad at all, but it doesn't take much to imagine how performance can degrade significantly over time as user and tweet numbers increase. During development I set aside some time to add dummy data into the site to continually test the performance of this query and coupled with using MySQL's EXPLAIN functionality refined it such that it was performant up to an acceptably high number of users and tweets. I'm no DBA so must admit this was a protracted period of trial and error coupled with much googling, though as is often the case with this sort of thing I didn't really know what to google for. I eventually stumbled on a Quora topic which gave me the terminology I was after: fan out on read and fan out on write (I strongly encourage you to read the topic for the full lowdown). As I said—it turns out feed generation is a huge area of focus (not surprisingly given that Facebook, Twitter et al depend on it). Just knowing of the terms 'fan out on read/write' gave me a huge amount of reading to do and helped steer my research. That was good enough for me. Twitter ran with fan out on read for a while until it stopped working for them. It was unlikely to stop working for faavorite for a very long time, so I stopped worrying about it and stuck with my approach. The user feed generation you currently see is all generated on demand: fan out on read. Real-time mini events feed: fan out on write. And Redis. And WebSockets. With a brain stuffed full of information I could barely remember, I had in mind the perfect excuse to use fan out on write: the real-time mini events feed present on various pages throughout the site. I'd been eyeing up Redis for a while too, so I decided to use that as the data store for it. So, why a completely different implementation for a very similar looking piece of functionality? The answer isn't particularly professional: the mini feed simply isn't as important as the main feed so I could afford to have a little fun with it. Secondly, a user's mini feed is always clipped to the last few events meaning the fan out on write model won't swamp redis with too much data over time. Thirdly, the events feed is allowed to be more transient—it contains comments, notifications when friends join faavorite, notifications when people favorite things, etc. It doesn't have to be 100% accurate—I don't ever delete an event from the mini feed (if someone faavorites then unfaavorites something, for example), so fan out on write just felt like a good pattern to try out. The full details of how the events feed works, including the real-time websocket notification system, are complex. I'll write them up in full in a later article. One comment we've received numerous times since launch is the fast page load speed. Hearing this is part flattering and part embarrassing, because the truth is we're not doing anything particularly clever to cause it. There's some rudimentary query caching and both Harry and I always try to write performant code in our respective disciplines, but there's not a lot to it except for one key thing: asynchronous page loads. I'm not going to write too much about PJAX—you can read about how this site uses it instead. It's worth being clear here: the speed benefit comes from asynchronously loading less page content. The 'P' in PJAX takes care of the rest - namely push and pop state (to update your browser's address bar), but it's not going to instantly give you a massive performance boost unless your backend architecture knows how to interpret and respond to a request containing the X-PJAX header. I spent a while tweaking this specifically to faavorite's needs—we use a custom version of the PJAX library and do some clever things on the backend to try and return as little data as possible per page load—a good example of this is that the events feed is not regenerated for a PJAX request if it was already present on the page. 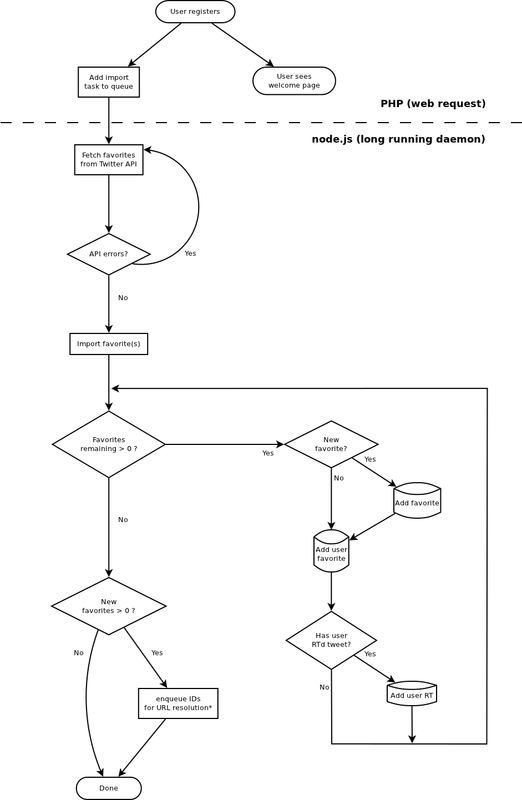 Integrating asynchronous page loads was not as easy as on paynedigital.com and I must admit I thought about pulling it at various points, but in the end the reward is absolutely worth it. I think a large part of the responsiveness of the site actually boils down to it feeling responsive due to a lack of a full page refresh. The rest is down to ongoing hard work elsewhere to make sure the codebase is as performant as possible. I suppose the last area of relevance (for now) is the hosting which powers faavorite.com. There's not a great deal to say other than it currently runs on a Rackspace Cloud server with 2GB RAM (rackspace don't publish clock speeds, but I know the VM has four cores). I've got a rough mental roadmap of how to scale the site across multiple machines as and when the need arises, and if cost wasn't an issue we'd already be running separate MySQL and Redis servers, but it's keeping us afloat for now. ZeroMQ architecture—how does the messaging layer all fit together? Events processing—how do we generate events and push them out in real time to any interested, active users? Monitoring—making sure things don't go wrong, and being alert when they do. The easiest way to keep up to date is to follow me or @faavoriteapp. If you aren't already, get following Harry and keep an eye out for his writeup about the mobile-first approach taken when building the frontend architecture too. In the mean time if you're not already then please—sign up for faavorite!